For those who enjoy “match three” style of games, one of the new unique options available on the iOS is Crystal Soul. As more games become available on mobile devices such as the iPad or iPod touch , many new genres that were once unheard of are rising to the spotlight. One genre that has become increasingly popular to play as an iPhone app is the “match three” genre. As in most “match three” games, Crystal Soul levels begin with different types of units placed across a map. Players must swap different units with each other until three of the same types of units are touching each other, at which point they will disappear from the map and cause all of the other units to rearrange. This aspect of the app is very similar to all other “match three” games and each of the 20 levels are very challenging and intriguing, making Crystal Soul excellent for those who enjoy these types of games. What makes Crystal Soul significantly different from the standard “match three” games, however, is the RPG element that is incorporated into the “match three” style. 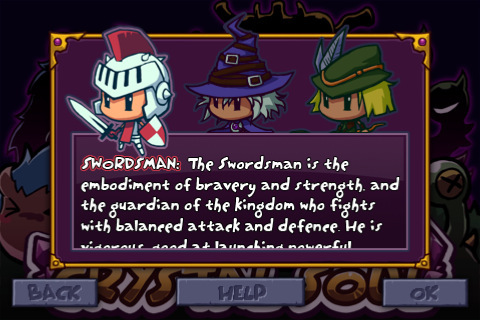 Before one can begin playing, users must choose between playing as a Swordsman, Mage, or Ranger. Each class of hero possesses unique abilities that will greatly affect the way one plays, meaning the app can be played three different times and will feel like an entirely new game each time. 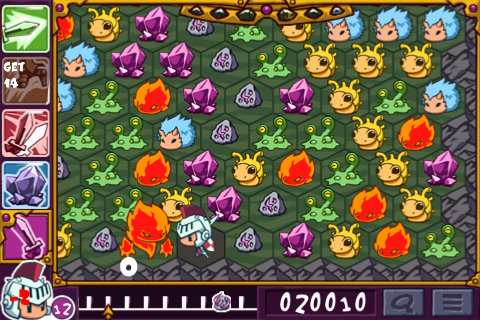 Instead of simply using the cursor to maneuver the units around the map, the player must actually move the character across the grid and battle monsters in order to get in position to move the units, making Crystal Soul incredibly unique compared to the majority of “match three” games. Although the RPG element of Crystal Soul is extremely unique and captivating, the one major drawback of the game is that there is no tutorial and the app may seem perplexing at first. Those who are used to traditional “match three” games may be confused about moving the character across the map and it can be difficult to understand how the attacks work without ample experimentation. Without any guidance or tips, players will have to spend a small amount of time attempting to figure out how the app works before they are able to begin playing for fun. Despite the lack of tutorial, however, Crystal Soul is a very high-quality application . Once players grasp the concept behind the app and understand the controls, many will find that this could be one of the best “match three” games ever made. AppSafari review of Crystal Soul was written by Darius Reimm on October 14th, 2011 and categorized under App Store, Games, Puzzler, Strategy. Page viewed 3908 times, 4 so far today. Need help on using these apps? Please read the Help Page.